Although it is well acknowledged that the anti-androgenic phthalate diesters can be readily hydrolysed into their monoester counterparts, their metabolites’ toxicology remains obscure. Herein, we tested the hypothesis that hydrolysis of one of the two ester bonds can mediate phthalate diesters’ potential endocrine effects in MLTC-1 Leydig cells, in line with their ability to disrupt androgen secretion in humans. Five diesters (DMP, DEP, DBP, DBzP and DEHP) and five monoesters (MMP, MEP, MBP, MBzP and MEHP) phthalates as mixtures or individually were applied to cell lines to investigate differences in phthalates’ hydrolysis associated with varying side-chain structures and steroidogenic effects. Short-chain diesters DMP, DEP and DBP are more readily hydrolysed compared to the long-chain DEHP, while aromatic alkyl chain DBzP cannot be metabolized completely in vitro. When the hydrolysis processes are interrupted, the diester phthalates’ steroidogenic effects can be influenced via regulating related steroidogenic pathway genes. With 10–100 μM treatment exposures, androgenic effects were observed only with DMP or DEP but not for MMP or MEP; while the phthalate diesters DBP, DBzP or DEHP generally exhibited more complex steroidogenic effects than their corresponding monoester counterparts (i.e., biphasic androgen and anti-androgen effects for diesters but monotonic androgen effects for monoesters were observed). 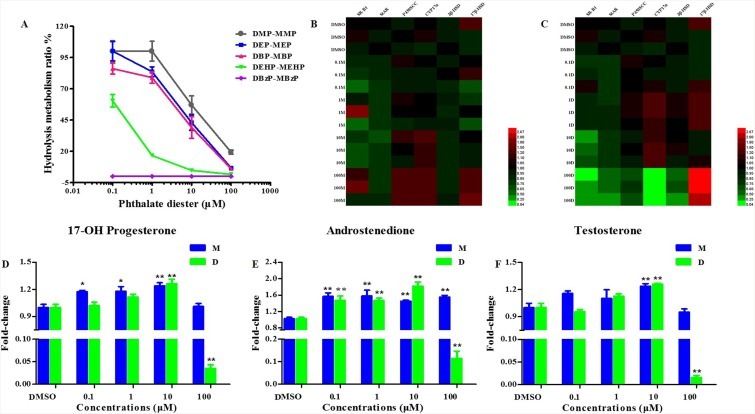 DBP elicited hydrolysis-related steroidogenic modulation, in which the anti-androgenic effects of diester DBP reversed into the androgenic effects of monoester MBP at 100 μM. Phthalate metabolites appear to exert different effects at an endocrine level compared to parent compounds, and deeper insights into how the hydrolytic process is related to this alternating toxicity would improve our understanding of a risk assessment for these widespread contaminants in male reproduction. Phthalates ester bonds associated with phthalates endocrine disruption.